An EcoNest is not just a home – it is a breathtakingly beautiful structure that nurtures health and embraces ecology, bringing together time-honored traditions and modern innovations for the best of both worlds. This unique approach to construction combines light straw clay, timber framing, earthen floors, natural plasters, and other natural techniques with the principles of Building Biology to create a handcrafted living sanctuary. The most comprehensive North American resource on light straw clay construction, written by its leading proponents, The EcoNest Home is a must-read for anyone considering building their own healthy, affordable, environmentally friendly, natural home. 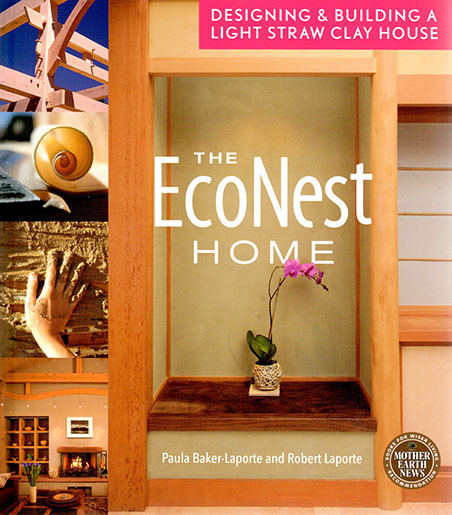 Paula Baker-Laporte and Robert Laporte are the creators of the EcoNest concept. Robert has built over 50 houses using the EcoNest system and has trained hundreds of professional builders and aspiring owner-builders in using the techniques. Paula has worked as the architect for the EcoNest Company for nearly two decades and is the primary author of Prescriptions for a Healthy House. Please contact us for shipping rates regarding international orders. While the rest of us look desperately to new technology to save us from ourselves and solve the problem of sustainable housing, Paula and Robert have found the answers in ancient technologies. Their beautiful homes, built of timber, clay and straw, have all the comforts we’ve come to expect, but they sit lightly on the land, and will do so for a long, long time. This masterpiece is recommended to [both] novices and experts.